A warm mango pie served a la mode with vanilla ice cream is a near perfect food experience. A galette is the lazy man’s way to make a pie! It’s a pie crust, folded up over fruit, making it almost impossible to screw up. So this recipe is essentially a lazy mans map to perfection. Combine flour, sugar, cinnamon, and salt in a large bowl. Using your hands (or a food processor), add butter, and crumble into the flour until the crust mixture resembles a coarse meal. Add the egg yolk, vanilla lime zest and water and mix together gently until dough is moist. It’s possible you might have to add a little more water. Form dough into a flat disc, wrap in plastic and chill for at least 1 hour. Mix together mangoes, sugar, and zest. Let stand for about 20 minutes. Strain and set aside, reserving liquid. Roll out dough on a floured surface until it forms a large, uniformly thick, circle about 16-inches in diameter. Place rolled dough on a large, thick, greased cookie sheet with sides or, better yet, a large, greased cast iron pan. 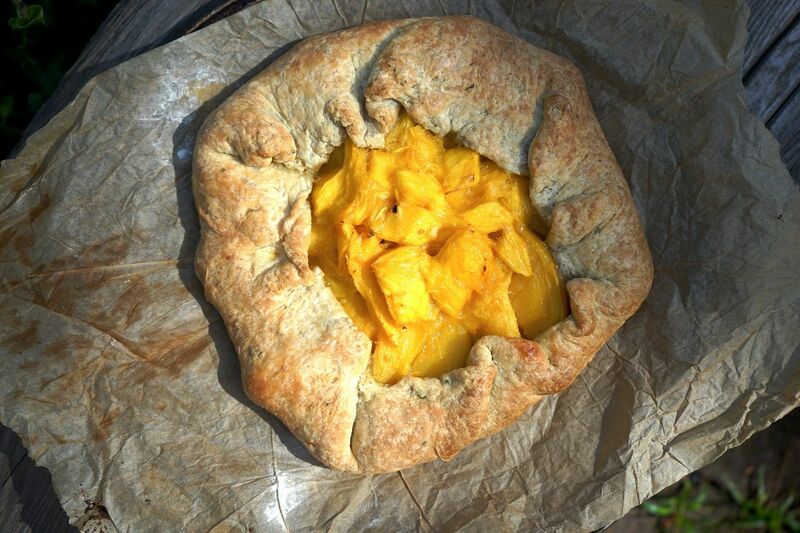 Place mangoes in a big pile in the center of the dough. Fold dough up all around the pile of mangoes leaving a big hole at the top like a shallow volcano. Pour a little of the reserved liquid in the hole and reserve a little for the end. Bake for about 30-35 minutes or until crust is golden brown and crispy. Drizzle finished tart with the remainder of the juice and allow to cool about 20 minutes before serving. Serve while warm with vanilla ice cream!